Gwyneth Paltrow gushes over gluten-free. Chelsea Clinton's wedding cake was baked without it. The new Old Spice guy avoids the ubiquitous protein to help stay buff. In fact, odds are good you too have tried — or at least encountered — a product with the gluten removed. Because gluten-free is what low-carb was a decade ago: The "it" diet discussed on daytime talk shows, promoted by hyper-slim actresses and adopted by masses. Grocery aisles are stocked with the likes of gluten-free pasta, crackers, cereal and beer. Americans are enthusiastically exiling a dietary staple that wasn't even in most people's vocabulary a decade ago. Unlike some other dietary boogeymen like trans-fats, gluten is not inherently bad to eat. Only a small percentage of people can't tolerate the protein, which occurs naturally in wheat, barley and rye. Plus, banning gluten from your diet can be really hard. Not only is gluten an essential element of traditional breads and pastas (it's the protein that gives them their structure), it often is used as a thickening agent in processed foods, such as ketchup and ice cream. And cutting out gluten is no guarantee of weight loss. The fad seems to be partly fueled by the celebrity factor: Paltrow talks it up on her website, Clinton stirred online chatter this summer when she ordered a gluten-free cake for her big day, and the muscular guy on the funny Old Spice commercials recently told Jay Leno gluten is one of the things he cut from his diet. Then there are the claims that going "G-free" makes you feel more energetic. "I feel better when I don't do it. If I go out to a restaurant with friends and I have a beer and a plate of pasta I'm going to feel it the next day. No one wants a gluten hangover," said Silvana Nardone, former editor-in-chief of Every Day with Rachael Ray magazine. Nardone, the mother of a teenage boy with a gluten intolerance, just released a cookbook of gluten- and dairy-free recipes titled "Cooking for Isaiah." These sort of claims are common, if hard to prove. But that hasn't slowed the industry's growth. 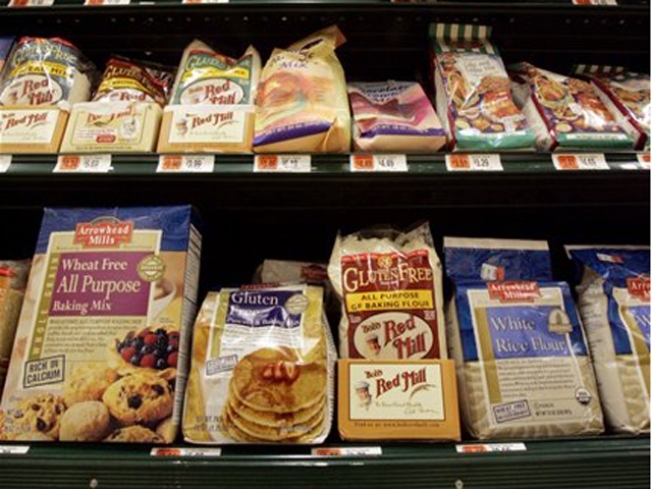 U.S. sales of gluten-free food has more than doubled since 2005 to over $1.5 billion, according to the market research company Packaged Facts. And the growth spurt is expected to continue at least through 2012. Gluten does affect some people, notably people with celiac disease. But celiacs, who suffer an immune reaction if they eat food with gluten, such as bread or pasta, are estimated to represent less than 1 percent of the population. Some other people have less severe gluten allergies or sensitivities. Dr. Alessio Fasano, director of the Center for Celiac Research at the University of Maryland School of Medicine, figures that up to 7 or 8 percent of the U.S. population have some kind of sensitivity to gluten. Yet about a quarter of U.S. adults are either trying to reduce or completely avoid gluten in their diets, according to the marketing firm NPD Group's Dieting Monitor. That means most of the people eating gluten-free foods probably don't have to, but want to. "Some of the people we're talking about most are people who are dabbling in raw foods and dabbling in vegan and dabbling in different things and they see gluten-free as part of that world," said Shauna James Ahern, better known as the popular blogger "Gluten-Free Girl." Ahern, diagnosed with celiac at age 38 after feeling "low-level lousy" her whole life, said that even as dabblers drop the diet, they build awareness of gluten-free, which leads to more people getting diagnosed. That's why she thinks the diet will still be around in a decade. Many of these gluten watchers are people like Akiia James, a 33-year-old news producer from Durham, S.C., who already was healthy and fit before she decided to cut out gluten and dairy several months ago. "The main thing is just feeling better after you eat, not feeling the weight of eating," James said. "I mean, I never anymore feel like I'm stuffed ... I think I still eat the same amount, but the ingredients play a big part." Why people report feeling better is not totally clear. And the connection may be indirect. People who eliminate gluten-rich foods may eat more produce, and therefore have a healthier diet overall, said Dee Sandquist, a spokeswoman for the American Dietetic Association. Fasano suggests that gluten is generally harder to digest, perhaps because it was only introduced to the human diet about 10,000 years ago. In evolutionary terms, that's not a lot of time to adapt to digesting a new protein. Dr. Brian Bosworth, associate director of the Gastroenterology Fellowship Program at New York Presbyterian Hospital/Weill Cornell Medical Center, noted that while gluten can certainly be an irritant to some people, he wouldn't make a blanket statement that it's harder to digest for everyone. "I don't think that, in general, that there's a reason to strictly avoid it," said Bosworth, who has celiac disease. Sandquist says there's no harm in avoiding gluten, as long as you eat a balanced diet. But she said it can be a challenge to eat a nutritionally sound without gluten, despite the recent proliferation of products. And watch out: just because a product is labeled gluten-free doesn't mean it's low in calories. And some gluten-free prepared meals can run high in both calories and salt. "There are just as many calories, if not more, depending on the food choices," Sandquist said. "It's all about the food choices."